Your Next Stamp May Release Sneak Peek! Hello! 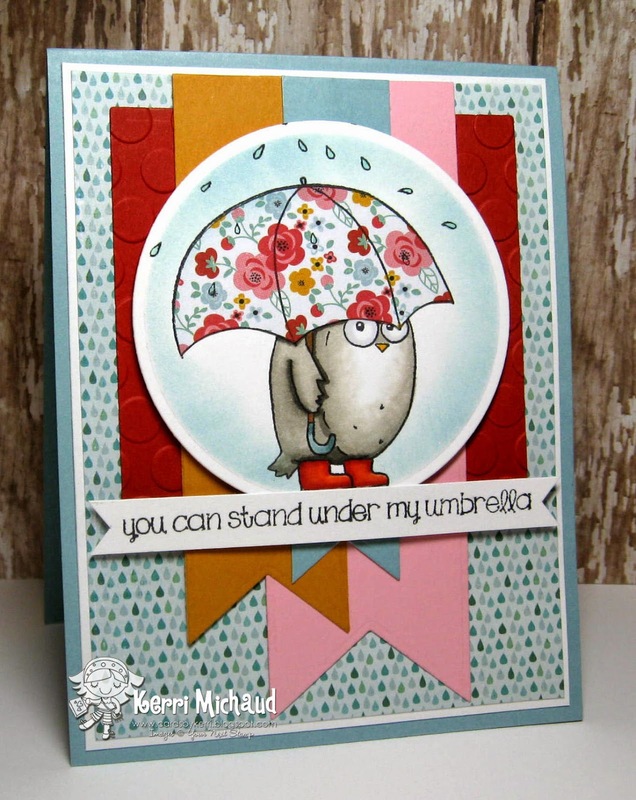 Tomorrow is the new release at Your Next Stamp but today we have some sneak peeks of the new stamps and dies:) I used the adorable new Rainy Day Owl clear set to make my card today. He just cracks me up! I paper pieced the umbrella with Pink Paislee Hello Sunshine dp (I would love an umbrella like that!) and colored the owl with Copics. I stamped a sentiment from the set and cut it out with a YNS Fishtail/Banner Die. The other fishtails in the background were also cut with these dies. I added a little sponging around the image and some texture using the CB Seeing Spots EF and it was complete! Remember, there is also a HUGE Spring Cleaning Sale going on at the YNS Store right now so check it out! Now head over to the Your Next Stamp Blog to see a list of the other designers that have peeks today and I'll be back tomorrow with a couple more new release projects! You won't want to miss them because they are sooooo CUTE!!! Have a terrific Tuesday! Kerri, your card is adorable! Love the paper pieced umbrella and all the layers! What a cute image, the owl is adorable. I love the paper piecing. Lovely card.